Malaysian hotel owner and operator Impiana Hotels, Resorts and Spa which in April opened its first luxury property Impiana Kata Noi Private Villas in Phuket, Thailand, is now looking at possible land acquisition to expand the property. "We have been offered some land beside this property and we are looking at the possibility of expanding," villa manager Jeanette Kelly told Business Times in an interview at the resort recently. "We are very positive about the market (in Phuket) as the property has been very well received," Kelly said, adding that it had received good support from the Korean honeymooners when it opened. Kelly said that the piece of land adjacent to its villa measures about 0.6ha. All four private villas and seven suite villas are sea facing. Built at a cost of Baht 250 million, each unit has its own infinity pool measuring 13m to 20m. Some pools are fitted with a jacuzzi and several units have a jacuzzi tub in the bathroom too. It offers 24-hour butler service and has 38 staff for the 11 units. The villa is expected to garner an average room rate (ARR) of Baht 17,000 and rake an average occupancy of 50 per cent in the first year of operations. "We don't want to overprice ourselves as this is our first boutique villa venture. We are testing the market. We need to build a reputation and our brand identity," Kelly said. While the villa may not have built a name yet, the Impiana brand is recognised as the group has two other resorts in Thailand - Impiana Resort Patong, Phuket and Impiana Resort Chaweng Noi, Koh Samui. Impiana Kata Noi is the third property in Thailand for the group. Apart from Koreans, the resort is targeting wedding and honeymoon crowd from Europe in the June/July period. Its target market is seasonal. The short -haul crowd from the domestic market and regional market is expected all year round. Impiana Kata Noi is also targeting European tourists in the summer, Christmas and New Year periods. The Chinese and Russian market is another category it is eyeing. She added that the villa is looking at holding wedding and luxury product launches. All units, which have a different theme, are fitted with LCD TV's, stereo systems and private espresso machines. Impiana Kata Noi also has a fully-stocked wine cellar, a cigar bar that carries limited edition cigars as well as a well equipped fitness centre. Meanwhile, in the second year of operations, Kelly expects that it will be able to achieve an average occupancy of 60 per cent to 65 per cent. "We hope to grow on that year-on-year and ARR will grow too." she added. RHB Investment Bank Bhd, the appointed price stabiliser for Sunway Real Estate Investment Trust Bhd (Sunway REIT), has been buying the shares over the past 14 days to help stabilise price of Sunway REIT shares. 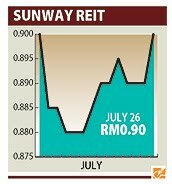 It bought some 30.6 million shares of Sunway REIT in stages over the past two weeks from prices ranging from 87.5 sen and 89.5 sen. Under Section 9(3) of the Capital Markets and Services Act 2007, Capital Markets and Services (Price Stabilization Mechanism) Regulations 2008, an investment bank can be given the authority by the share issuer to help stabilise the share price. The Act also states that the period for any stabilising action will be thirty calendar days starting from the first day of trading on the stock exchange of the relevant securities. Regardless of the buying by the investment banker, Sunway REIT shares haven't moved much, but it has managed to stop their price from sliding. Sunway REIT closed the day at 90 sen a share, unchanged from its initial public offering (IPO) price. Jupiter Securities head of research Pong Teng Siew said he does not expect the stock to move much from the current levels. "I also do not expect institutional shareholders to sell down the stock, but there is some retail selling," admitted Pong. Apart from RHB who had bought the shares in batches, Sunway REIT non- executive chairman Tan Sri Jeffrey Cheah Fook Ling's Sunway Education Group Sdn Bhd also bought seven million shares in one go on July 13. An analyst, who covers the stock, said the selling pressure on Sunway REIT will continue until its yields recollect to the sectorial average. "One way for the yields to go up is for the price of the stock to go down." said the analyst, adding that Sunway REIT's yield is about 7.5 per cent against the industry average of between 8.5 per cent and 8.9 per cent. The analyst, who did not want to be named, said only then she sees buying interest in Sunway REIT coming into play. Pong, meanwhile, also noted that RHB may have used its powers as the market stabiliser to buy Sunway REIT shares because "there is no point having a capital loss on top of weaker yields". He added that generally, market stabilisation activities only forestall the inevitable. Sunway REIT, the property trust controlled by Sunway City Bhd, made its debut on Bursa Malaysia on July 8. It had raised RM1.5 billion, making it the biggest IPO in Southeast Asia this year. The key theme for Malaysian shopping malls over the next decade is regeneration. It is a transformation that includes both an extension of an existing mall or an extensive makeover of a mall, Malaysian Association for Shopping Complexes and Highrise Complex Management (PPK) president HC Chan said. "After a 35-year history of malls, we are now entering the regeneration phase. Some of the shopping centres will undergo a change," Chan said. "There will be more regeneration (activities) rather than building of new malls," he said, adding that malls will transform to become more niche. This, Chan said, largely because the current 100 million sq ft of net lettable area of retail space within shopping complexes is sufficient to cater to the existing market. Regeneration via expansion included Mid Valley Mega Mall, which added the Gardens, Suria KLCC with a retail podium in Lot C, and Sunway Pyramid, which added a second phase and is now working on a third and a fourth retail phase. One mall that recently underwent a major makeover is The Mines following the takeover by CapitaLand's CapitaMalls Asia Ltd.
Another example is KL Plaza that will be relaunched as Farenheit 88 after it undergoes a massive RM100 million renovation. Similarly, UE3 (now Viva Home), Phoenix Plaza and Kenanga Wholesale Centre are also being rejuvenated. "Until the greater Kuala Lumpur plan takes shape, there will be no mega shopping structures. Until then, there will be only medium-sized malls," Chan said, adding that most other mall openings will continue to be within the Klang Valley. "The next wave of substantial shopping malls development will be in the next three to five years when huge parcels of prime Kuala Lumpur land are opened for development," Chan said. Today, the Malaysian shopping mall industry comprising 300 malls is worth some RM100 billion in real estate value and provides direct employment for 500,000 people. SINGAPORE: Starhill Global Real Estate Investment Trust, a Singapore-based investor in retail and office buildings, got S$496mil (RM1.16bil) of three-year loans from five banks, according to a Singapore stock exchange statement. DBS Holdings Ltd, Oversea-Chinese Banking Corp, Commonwealth Bank of Australia, Societe Generale and ING Groep NV provided the loans, which include a S$50mil revolving credit facility, the statement said. The proceeds would be used to refinance S$447mil of maturing debt while the balance will be made available for working capital and general corporate funding purposes. In a revolving credit facility, money can be borrowed again once it’s repaid. Sime Darby Healthcare is expected to invest RM250 million for the Sime Darby Medical Centre in Ara Damansara, Kuala Lumpur, which is anticipated to be opened next year. In a statement today, Sime Darby Healthcare said plans are being drawn up to fit out and equip the centre with specialised facilities and services for the treatment and management of heart, neuro, spine and joint diseases. It said the new 220-bed medical centre, will be the third medical facility established under the group, after the flagship Sime Darby Medical Centre in Subang Jaya and Sime Darby Specialist Centre Megah in Petaling Jaya. Tan Sri Dr Wan Zahid Mohd Noordin, a Sime Darby board member who oversees Sime Darby Healthcare said the medical centre will focus on quality, safety and continuous improvement, especially in areas that most directly impact patient care. The neuroscience unit in Ara Damansara will feature a comprehensive epilepsy management programme that includes an electroencephalogram or EEG studies laboratory and state-of-the-art equipment for early diagnostic and treatment capabilities. The centre will also have a fully-equipped and state-of-the-art rehabilitation facility including a specialised Stroke Care Unit, hydrotherapy, occupational therapy, audiometry, musculoskeletal rehabilitation using wax and splints and a Child Development Centre with Snoezelen and speech therapy. Snoezelen or controlled multi-sensory stimulation is used for patients with autism, intellectual or mental disabilities, post-traumatic stress disorders or brain injury. The hospital will also be installing a new Hospital Management Information System that will allow, amongst others, central appointment bookings and management of patients' health records in a seamless manner across all the Sime Darby medical facilities.